A hunter wanted to hunt a deer in a desert. After running a long distance, the deer saw Imam Reza (PBUH) (who happened to be there) and took refuge with him. When the hunter was going to catch the deer, Imam Reza (PBUH) prevented him from doing so. However; as the hunter believed that the deer was his own hunt and belonged to him legally, he insisted on taking it back. The Imam offered him some amount of money (more than the real cost of the deer) to release her. However; the hunter refused the offer and said: I just want this deer which is mine and nothing else. At this moment the deer became able to speak and told the Imam;’ I have two hungry fawns waiting for me to go and breastfeed them. This is why I have run away’. Then she asked the Imam to guarantee her and to ask the hunter to let her go back, feed her fawns and then return; surrendering herself to the hunter. 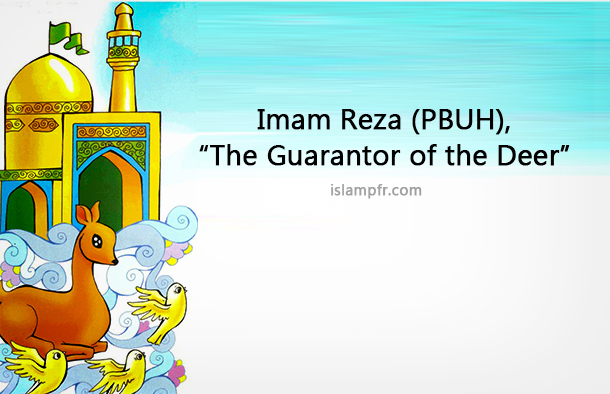 Therefore, Imam Reza (PBUH) guaranteed the deer against the hunter and stayed there as a hostage until her return. So the deer went away and returned quickly, surrendering herself to the hunter. Seeing the deer fulfilling her promise and realizing that his hostage was Imam Reza (PBUH), the hunter was deeply moved and released the deer immediately. Then, he begged and apologized to the Imam. So the Imam gave the hunter a substantial amount of money and promised to intercede for him to his ancestor (the Holy Prophet (PBUH)) in the Day of the Last Judgment, sending the hunter away well-pleased and satisfied. Finally, the deer that was released with the help of the Imam, asked his permission to leave and went back to her fawns. Although this exact story is not available in Shia sources, narrations similar to the stories popular with the general public and folks can be found in the miracles ascribed to the Prophet Muhammad (PBUH) , Imam Sajjad (PBUH) , Imam Sadiq (PBUH) .